The iConverter® XM5-1G is a multi-port Gigabit Network Interface Device (NID) that provides service demarcation and aggregation for Carrier Ethernet 2.0 services. The XM5-1G provides comprehensive support of the latest carrier-class Ethernet Service OAM, testing and protection standards. These advanced capabilities enable rapid service deployments, Service Level Agreement (SLA) assurances, comprehensive fault management and service protection to reduce operating costs and improve customer satisfaction. The XM5-1G features a combination of Gigabit SFP ports and 10/100/1000 RJ-45 ports for UNI or NNI deployments to deliver wholesale Ethernet, 4G/LTE mobile backhaul, business and cloud services. The XM5-1G can be deployed to deliver a variety of Gigabit and Fast Ethernet services, and simplifies operations by reducing the need to inventory multiple NID models. Fast Ethernet SFPs can be installed in the Gigabit ports to provide a seamless upgrade path to future Gigabit services. 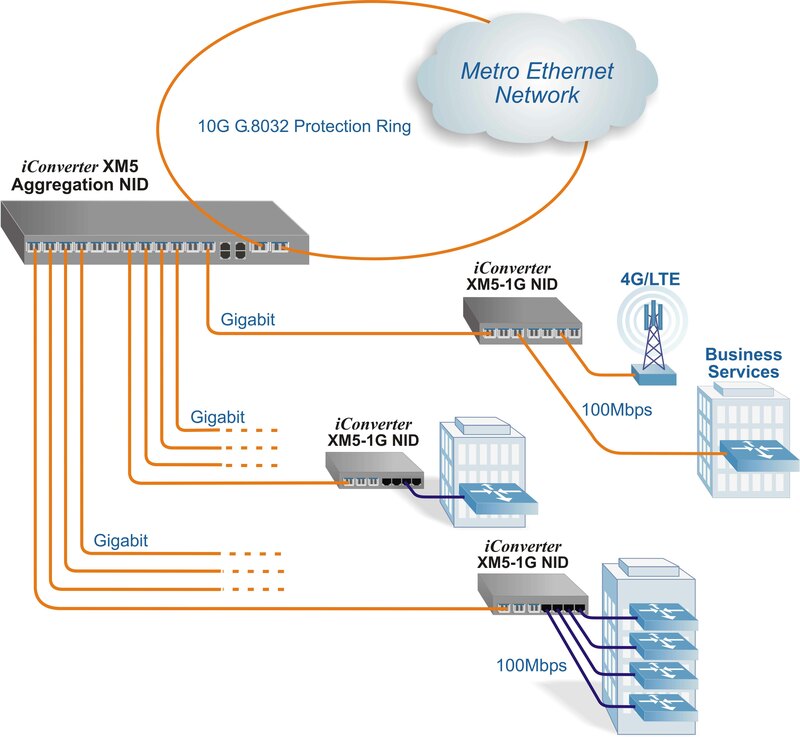 In this application example, an iConverter XM5 10G Aggregation Demarcation Device is deployed as an Carrier Ethernet aggregation node on a 10G fiber ring. iConverter XM5-1G NIDs terminate the Gigabit fiber links and provide 100Mbps service demarcation at cell towers and customer premise. The XM5-1G NIDs provide comprehensive support of Carrier Ethernet performance monitoring, fault management, timing and protection standards to enable rapid service deployments and service assurance. 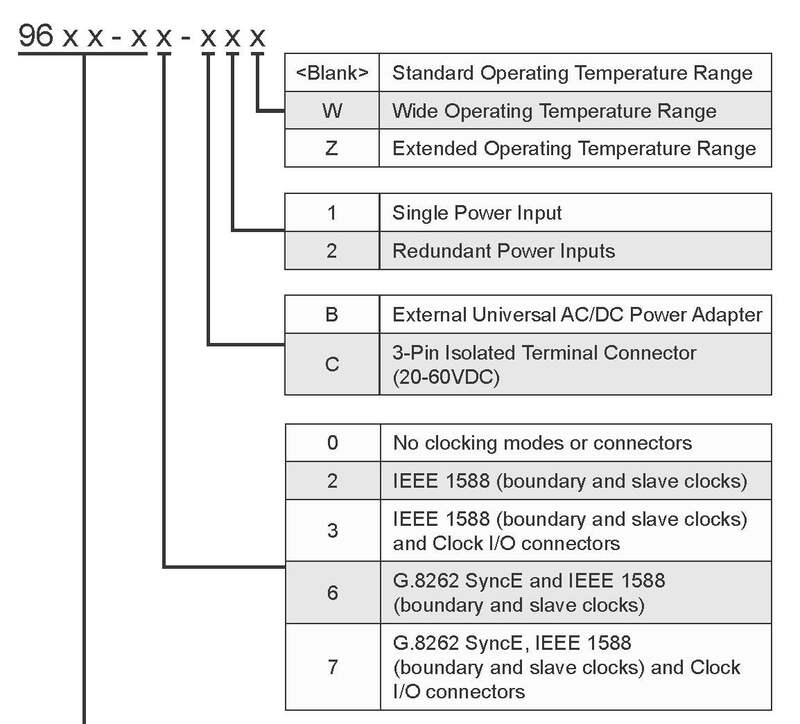 All models support IEEE 1588 Transparent clock mode. See Omnitron’s SFP web page for SFP ordering information.